Thanksgiving week is usually a great time to take time with family and friends to reflect on God’s faithfulness to us individually over the past year. It’s also a great time to take time to look ahead to the Christmas season; not just the rush of busyness of shopping, parties, traveling, wrapping presents or wrapping up end of the year. Today is a great time to take time to look ahead to a season of worship: praising God for the indescribable gift of His Son, Jesus. 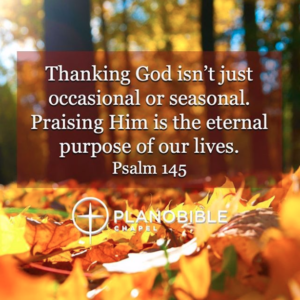 Praising God isn’t just occasional or even seasonal －Praising God for who He is and telling others about what He has done is the purpose of our lives. That’s the focus of God’s Word from Psalm 145.